There are a number of solutions available for creating websites, each with their own advantages, disadvantages and fanatical user bases championing each of them. This means finding the solution to publish your content could be tough. Make the wrong choice and you’re potentially stuck with a platform that causes you headaches and grief further down the line. Fortunately, there’s a publishing platform available with the right balance of functionality, flexibility, cost, and support to match hand-coded websites and it also outperforms the other available solutions. That platform, of course, is WordPress! In this post, we will look at six reasons why WordPress should be the go-to publishing choice for your website, but first of all, let’s look at exactly what WordPress is, along with a little back history. Put simply, WordPress is a platform for publishing self-hosted websites. Its interface is accessed through your web browser and other than using a File Transfer Protocol (FTP) client for the initial install, WordPress offers you everything you need to publish your content. In fact, if you choose the right host, you wouldn’t even need an FTP client. WordPress was first launched in 2003 by two developers who wanted a better solution for publishing their blog content (Matt Mullenweg and Mike Little). 13 years later, WordPress has now grown to power over 25% of the internet – with high-profile users such as TechCrunch, the Washington Post, and BBC America, to name a few. Its humble beginnings solely as a blogging platform are still present, but constant development has meant WordPress has evolved into a full-featured Content Management System (CMS). With developments such as the incoming REST API on the horizon, WordPress looks to become even more dominant in the future. Now we’ve briefly looked at its history, let’s take a deeper look at some of the reasons you should choose WordPress as your publishing platform. An important aspect of WordPress’ freedom is its protection under what’s known as the GNU General Public Licence (GPL). This licence lets anybody use, share and modify the software. Also, in contrast to a standard copyright, any derived works must also be released under the GPL. What this means is WordPress is free, and will be freely available forever. While WordPress is highly unlikely to be unsupported in the future (WordPress’ parent company Automattic was recently valued at $1–2 Billion, and the CMS is the cornerstone of their business), its open-source nature means other developers are free to take over the project if development is halted. Plus, because of the GPL, they too would have to make their work freely available. There are many more examples of WordPress’ ease of use, such as the infamous five-minute install procedure, automatic updates and its myriad of social sharing and user interaction settings, among others, the content editing options are just the tip of the iceberg. Your website’s overall design and layout doesn’t require the knowledge of your garden variety web developer either. 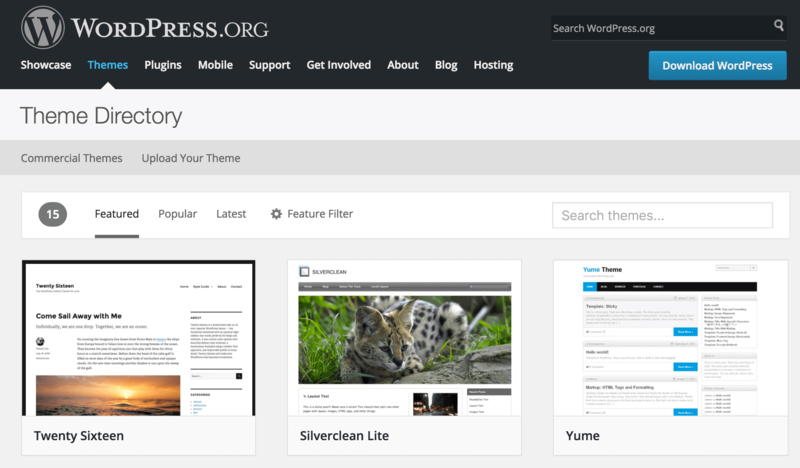 For a start, WordPress includes several default themes designed to show off its core functionality. While these themes perform admirably, there are thousands of other themes to choose from, all completely free, within the WordPress Theme Directory. Because they’re free, you’ll find that the quality of themes varies. However, the Theme Directory includes a five-star rating system, awarded by users, to help you make an informed choice. There are thousands of plugins available for free within the WordPress Plugin Repository, each providing different additional functionality. In some cases, such as Super Cache and Yoast SEO, free plugins found here can be practically essential. Similarly to themes, the premium plugin market is rich, with sites such as CodeCanyon offering thousands of plugins for purchase. Again, like premium themes, you’ll often find more committed development and dedicated support when compared to free options. Finally, as WordPress has grown, so has its developer base. The platform attracts contributors from all manner of other fields and industries, who pool their talents to make WordPress better. Updates to WordPress itself are frequent, with a team of hundreds releasing three core updates per year. Unlike a hand-coded website, setting up an e-commerce solution on your WordPress website is easy when using one of a number of available plugins. One such example is WooCommerce – currently the most popular e-commerce solution available and integrated with Avada. Its strengths lie in how fast it is to set up a store and its support from all major payment providers. You’re not restricted to just WooCommerce though. There are other solutions available, such as Easy Digital Downloads (specializing in digital only products), and Shopify as an alternative to both. Finally, while it’s not a WordPress-specific solution, by adding an open-source SSL certificate from Let’s Encrypt, you could potentially build an online store with WordPress, Avada, WooCommerce, and Let’s Encrypt for very little outlay. Find a suitable web host for your website that ideally offers one-click WordPress install. Look for a theme that can help you create an amazing websites with advanced options that require no coding, is constantly updated and provides 5 star customer support, such as Avada. Browse the WordPress.org Plugin Directory to see the scope of what plugins are available for download. WordPress will be free forever. Using WordPress is as easy as using your favorite word processor. There are many free themes and very feature rich premium themes such as Avada. You don’t have to know code in order to design and manage your site. WordPress can be extended with plugins to provide extra functionality. A large, strong community means you’ll never be without answers if you’re struggling. Selling products is easy, with several e-commerce solutions available to get started instantly. What are you looking for in a WordPress website and what might be holding you back? Let us know in the comments section below! Image credit: 9355, magicaltar0, WordPress.org. The one thing that i like most about wordpress other than its huge support base, is its simplicity. Even a person with out any previous experience can use it after very little practice. Thanks for great insight btw. WP is my favorite but not perfect CMS. Learning it was pretty easy! Good stuff! I am a WordPress snob and working with it since 2006 and still now my first preference for doing blogging on WordPress. You are right, one need not to be a developer to run a blog if you work on WordPress. Also, very easy coding and lots of plugins, that no other platforms offer. Thanks a lot for sharing a useful topic.